I just received my stay with me powder and oil which I want to use on my target so that she stays with me. Please tell me what to say when I'am sprinkling it and dusting myself also when applying the oil. 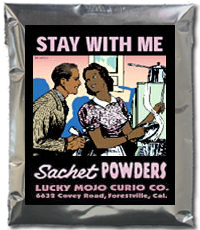 You can say, ***will stay with me and be my faithful lover or recite a Psalm, read what the Stay With Me website site recommends (http://www.luckymojo.com/staywithme.html). Sprinkling powder on the floor or carpet is a great idea. Mix it with some local dirt to cut the colour down to something inconspicuous. You can order right here in the Forum by clicking on the the blue Add To Cart button. Is there anything unusual that would occur after laying the powder for my lover? I'm asking because he has been unfaithful in the past and I want to know how you would know if it has worked? well, if he stays with you and doesn't run around anymore, you know it worked. You may have to continually lay the tricks to keep him faithful to you. I love the Stay with me line! I wear the oil mixed with Dixie Love and Follow me boy everyday, I also spray the bedroom regularly with a bath crystal solution of Stay with me + Love me + Stay at home and I dust the mattress with a sachet powder blend of the same three, I don't think my ex is going anywhere soon!